The valley we are talking about is full of life and one can experience the positive energy. Trekking for 16 kms that connects two road heads can be done in a day or 2. One can experience the village life, nature, wild life, birding, local culture, trekking, camping and angling. RajGundha & KukarGundha are twin villages which have beautiful environment, Villages are well connected with other villages but still not connected with the road and have amazing views and the loveable aroma all around the valley. This valley is full of birds and wild life. Villagers here live here for 6 months and in winters move to lower places with their cattle’s to save them from snow and cold. Houses made up of old traditional way with stone and mud. Earlier this area was under wild life sanctuary but recently village area removed from wild life and used as agriculture land. Badagran is an old village and traditional heritage of Himachal . Here in the village houses constructed with stone slates and big wooden logs. This village is recently connected by road with the other lower area of Himachal Pradesh. Villagers live on cattle’s and the vegetables they grow, valley is tremendously fertile to grow the vegetables and the pulses. Area is disconnected with other parts in winters due to heavy snow fall, that’s why villagers store the sufficient food stuff and woods for winters, few of them move to lower parts. These villages fall in Chaota Bhangal of The Bhangal valley is in Kangra District of Himachal Pradesh and it is divided in two different sub-regions; Bada Bhangal and Chota Bhangal which are divided by thamsar pass of 4500 mts. There are 7 panchayats in the Bhangal reagion. Out of these panchayat only 3 are connected with road. 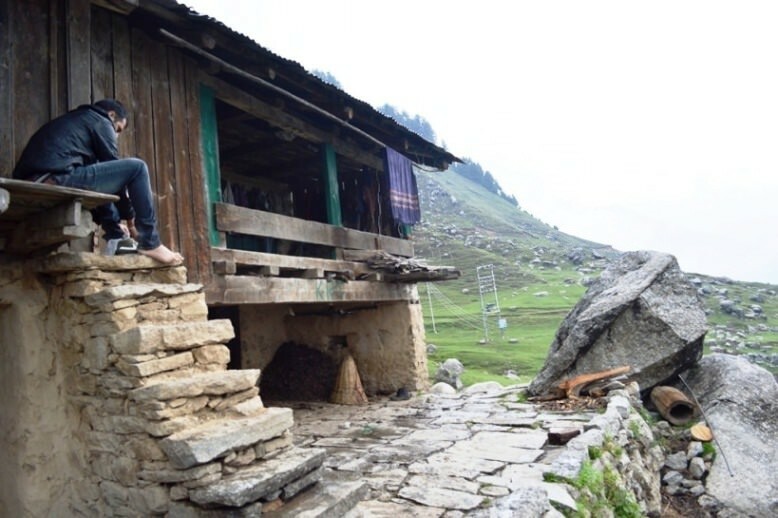 Chota bhangal region is easy reachable throughout the year, but Bada Bhangal region is disconnected in winters as the Bada bhangal region is for and over the Thamsar Pass of 4500 mts. Bada Bhangal region is connected by three sides but all the ways are over the high mountain passes and a long treks. First one Kangra valley through RajGundha, 2nd is Chamba valley through Naya gran and third side is Kullu. All the three routes are disconnected during winters due to heavy snowfall and valley is hidden during winters. Bhangal region is once ruled by Bhanghaliya dynasty. Ruled the valley from RajGundha in Chota Banghal. Bhangaliya dynesty rules the valley for many decades and sustain it till drug mafia’s reached here. Valley was earlier famous for Bhang (cannabis crop), which is now known for drugs but during Bhangaliya rule, Bhang was used for medicines, to prepare cannabis shoes, carpets, ropes and many of the daily usable stuff out of that as Bhangalies are expert in using Bhang for various items. But later on movement of drugs mafia’s from the other part of world to the this region spoiled the people by proving easy money which destroyed heritage of the region. Providing Bhang to drugs mafia became the easiest way of earn money and spoiled hardworking people here which make them forgot their true art of making items out of Bhang plants. But govt. destroyed all the Bhang field when come to know about all this illegal stuff here which decreased the drug mafia movement. But also the old culture of valley which is known for Bhang true usage was lost. Destruction of Bang field and death of Bhangaliya king, forces villagers to move lower planes for food and better life, as self sustain techniques were lost here. But the situation is different here as the villagers start moving back to valley after Govt. initiative to set up a information centre for agriculture. As this land is blessed with high fertility, agriculture here has tremendous scope. Now people grows vegetables and pulses here. This all make villagers semi nomadic as they move here in summers to grow vegetables and move back their lower homes in winters with their cattle’s. Now the valley again starts flourishing. Vegetables here are supplied to Punjab and Himachal. The death of Bhangaliya king is also a mystery and have many stories. Some says king’s sister was married to Mandi’s King, but Mandi ruler does’t like the well flourishing Bhangaliya rule in his neighbor. Once King of Mandi discussing with his wife about Bhangal region but his wife praised King Bhangaliya and this make him full of Jealous and he decided to destroy the fame of Bhangaliya king and show his wife about power of Mandi rule. Bhangaliya king has lives in his fortress at the Hanumangarh at the top of mountain at 3500 mts, this place is visible from all around the valley and even from Mandi. Mandi king always observe the this mountain and Bahnagliya king’s presence there and though of capture the area. It’s also believe that Bhangaliya king was follower of Lord Hanumana and believed a devine soul. Once king Bhangaliya was called down by Mandi king by giving excuse of Bhangaliya kings sister health (wife of Mandi king). Bhangaliya king start moving down riding his horse, but horse was not wishing to move down to valley, bur Bhangaliya king want to see his ill sister and forced his horse towards Mandi. At the entry bridge of Mandi, horse again resisted to move into the Mandi town. Once king Bangaliya enters the fort his head was slaughtered at the entry gate by King of Mandi and hanged it at the gate top. Mandi king was saying again and again and about his powers over Bhangaliya king. Bhangaliya king’s head was still laughing on him and said Bhangaliya still above you. After the death of Bhangalia king head was buried under the clock tower of Mandi’s Indra Market. But story not ends up here. This sinfull act of Mandi ruler make the Mandi valley cursed and people start dying daily in the number of 30’s and 50’s, which make king worried and move to Revalsar lake to see the Priest of the temple. Priest visited Mandi and advised Mandi King about the curse on the valley due to Killing of divine soul in the Mandi. Priest asked Mandi king to Honors King Bhangaliya to dis curse the Mandi. Then Mandi King Honors Raja Bhangaliya in Shivrati fair with a procession of horses Every year during the Shivratri Procession in Mandi an empty horse leads the way ahead of Radha Madhav Ji, which supposedly belongs to the Raja Bhangaliya. Truthness of such stories confirmed here as at the top of valley still have the remains of two fortress of King and queen along a Hanuman temple at Hanuman Garh. At Hanuman garh you can feel that how lord Hanumana watching valley and protect it from bad evils. People have high believe on the Hanuman who is at top. But trek from Raj Gandha and Billing is takes 2 hrs and 4 hrs respectively. But visit to this valley force you to forget everything in life your stress, pains here and dissolve you in the nature’s true aroma. I suggest readers to reach here and feel it and share it with others.